Although it was good to see the venerable old metal Fire Prism updated with a new plastic kit, I had some reservations about the design. Overall I liked the concept, but several (admittedly minor) features seemed flawed to me and collectively they made the new-style turret seem "off" somehow. I decided to convert one of the new turrets to try to address these small annoyances. These minor changes required a disproportionate amount of work to achieve and the end result is only superficially different from the original, but despite this I think that it was worthwhile! I have two of these converted turrets in my collection. 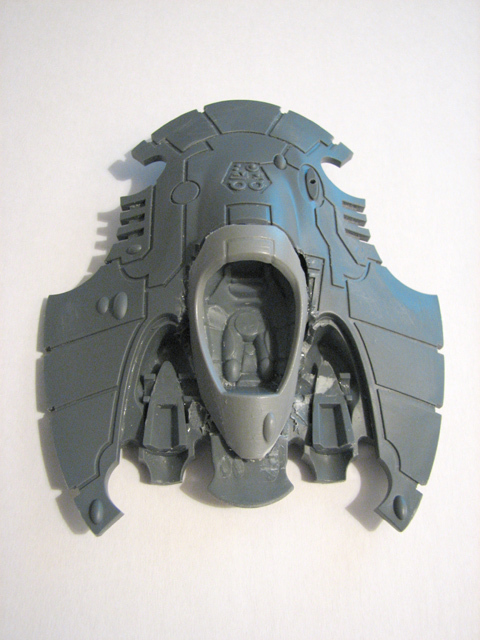 This canopy actually has a slightly lower profile than the standard one that is used on the Falcon, Wave Serpent, Vyper and War Walker. This decision seems strange to me and the new cockpit also looks slightly too wide and too flat as a result. 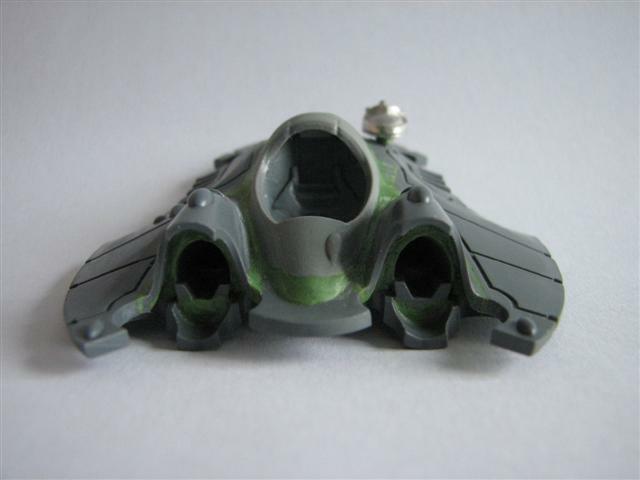 Using an ever-so-slightly different shape and design of a component that has been used in Eldar kits for over ten years is distracting. Having made a wide, low turret the silhouette is spoiled by this long, protruding vane. 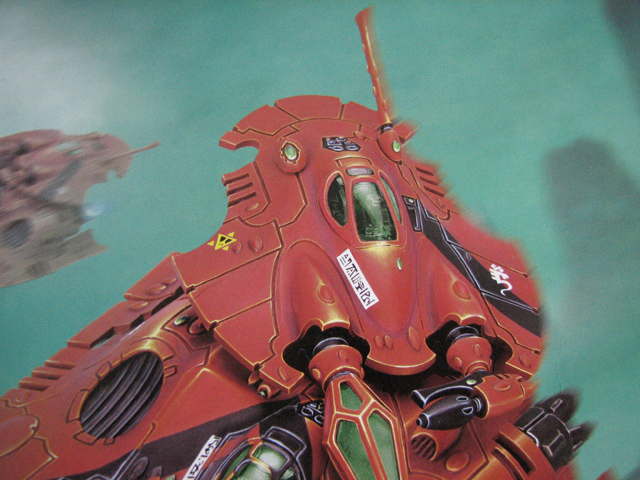 My main gripe with the design is that the "nose" of the cockpit is too pronounced; this also means that the cockpit is set too far backwards and the canopy sits rather flat compared with other turret designs. 1. 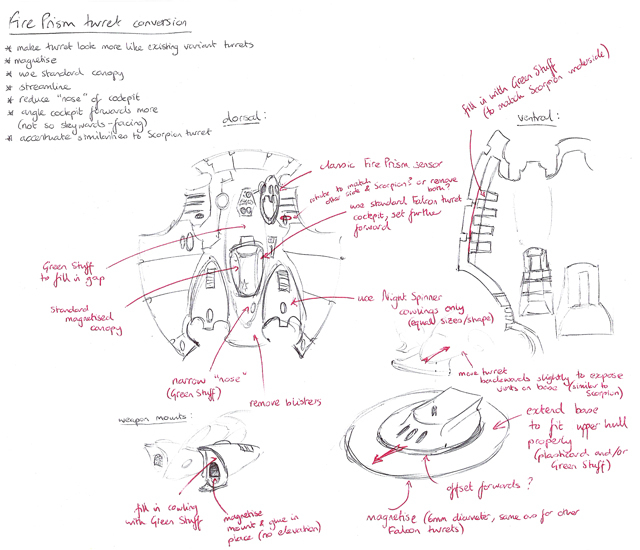 A close-up photo of the new turret design and my thoughts on some of the design aspects that I wasn't so keen on. Additionally, I decided against using the new components for the main hull (the vectored engines, star engines and alternative access ramp), preferring to use my standard (albeit heavily converted) Falcon chassis instead. 2. My concept sketch for the conversion. I wanted to see if I could create a turret that was (subtly) more in keeping with the existing Falcon turrets and that of the Forge World Type II Scorpion superheavy grav tank, whose design was clearly a major reference when the new Fire Prism turret was designed. The Falcon cockpit was cut down as much as possible without damaging the interior detail. 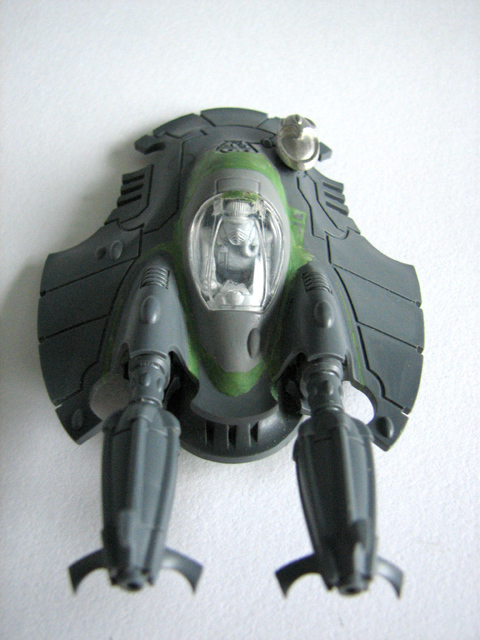 Due to the cockpit sitting further forwards in the turret it wasn't possible to have the weapon mounts able to rotate up and down, but that was fine as I was more interested in magnetising them instead. 3. In order to incorporate a standard Falcon cockpit, I had to hack away a lot of the internal structure of the new turret. 4. The new turret with the old Falcon cockpit in place. 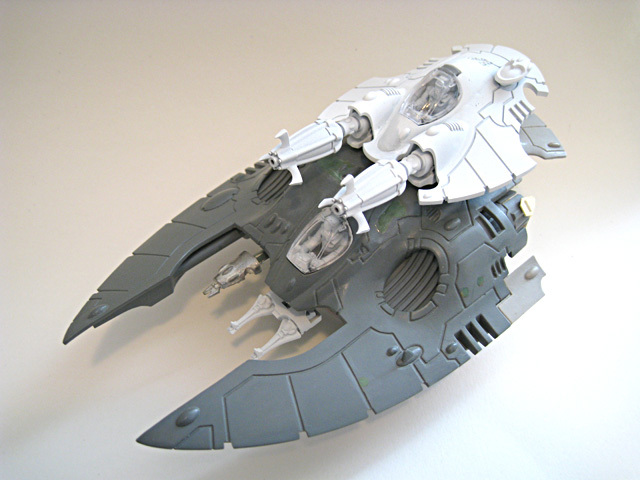 Although the cockpit sits only a few millimetres further forward and is only subtly different in shape, I was satisfied that at this stage the turret already looked more like that of the existing Falcon and Scorpion. Each weapon is held in place with six pairs of 2mm diameter neodymium magnets. I decided to use Green Stuff to fill in the gaps between the end of each weapon and the surrounding cowling so that the weapons would fit snugly. 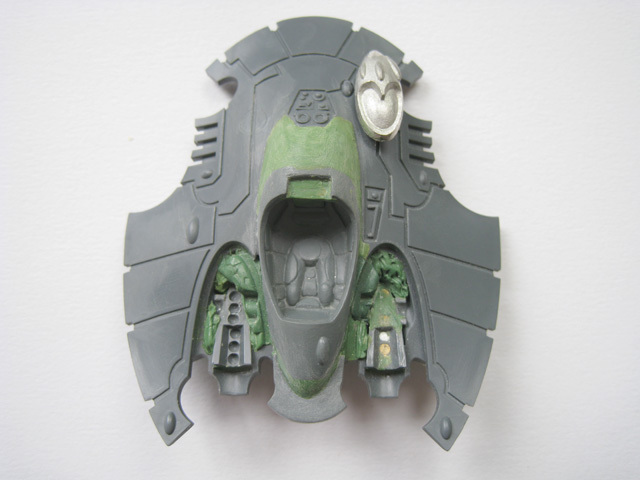 Green Stuff was used to model a smaller, narrower "nose", resolving my primary dissatisfaction with the new design. 5. 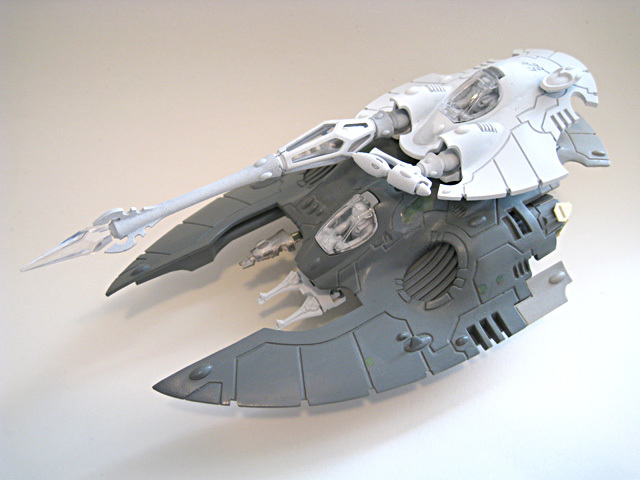 The turret continues to take shape and the Fire Prism weapon options have been magnetised. 6. 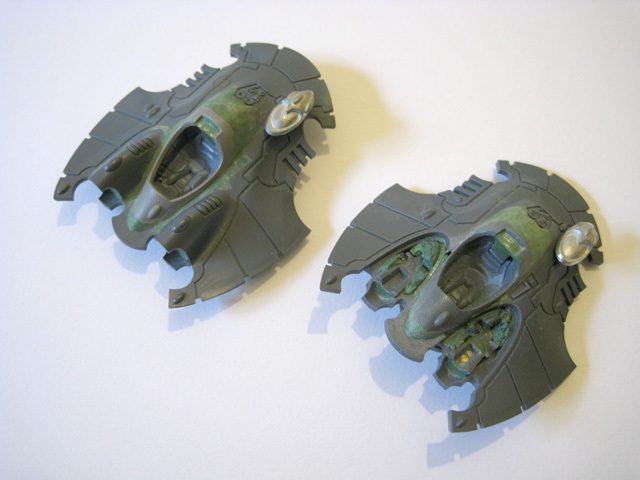 A frontal view of the completed weapon cowlings. 7. 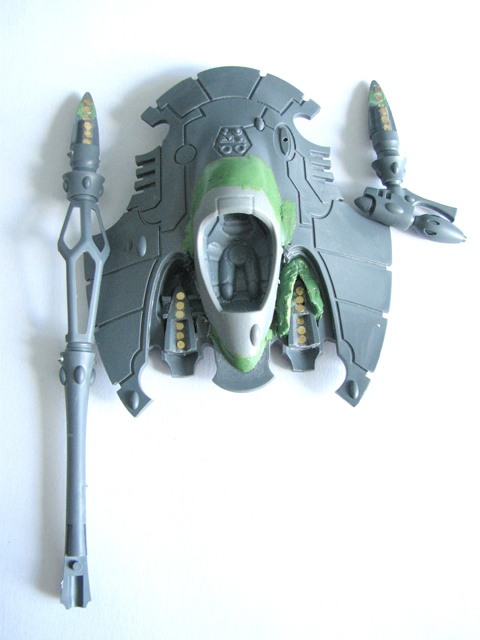 The magnetised Night Spinner weaponry. With the large sensor on the left of the turret dominating it, I decided against including any additional details on the right. I used superglue to fill in the circular indentation and a needle file to continue the linear one bisecting it. I wanted to use the classic Fire Prism sensor as I've always liked the design of it and I wanted to include something that tied the new turret's design with the old. 8. A close-up of the completed turret. 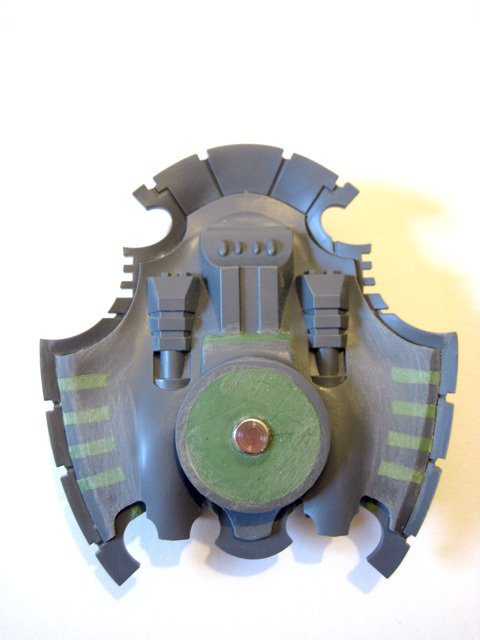 The base of the turret has been set further backwards (so that it is more central) and filled in with Green Stuff. Due to the weight of the turret I used a thicker (4mm) magnet to attach the turret to the Falcon hull. I filled in these notches with Green Stuff. 9. The underside of the converted turret. 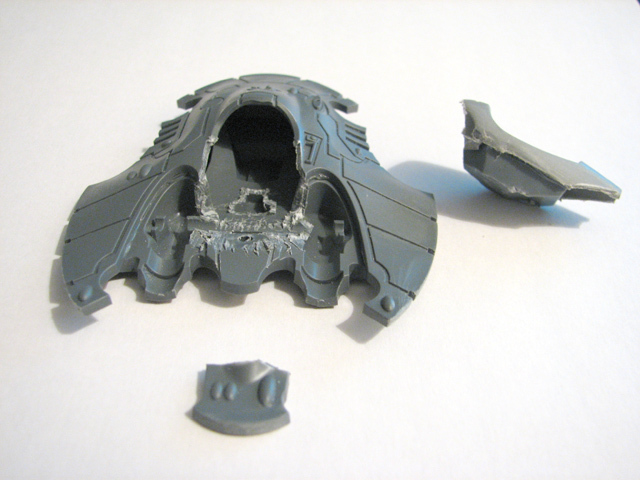 Most of the changes made to the bottom of the turret were done so as to make it look more similar to that of the Scorpion turret. 10. With the first turret completed and undercoated, here it is on one of my Type II Falcon hulls. This is the Night Spinner configuration. 11. Fire Prism configuration. The Prism Cannon has not been glued together at this stage, making painting easier. This time around, I was able to preserve the detail alongside the cockpit. The cockpit canopies are now held in place using magnets embedded in a small part of the hull attached to the canopy. 12. A second Fire Prism turret takes shape. 13. 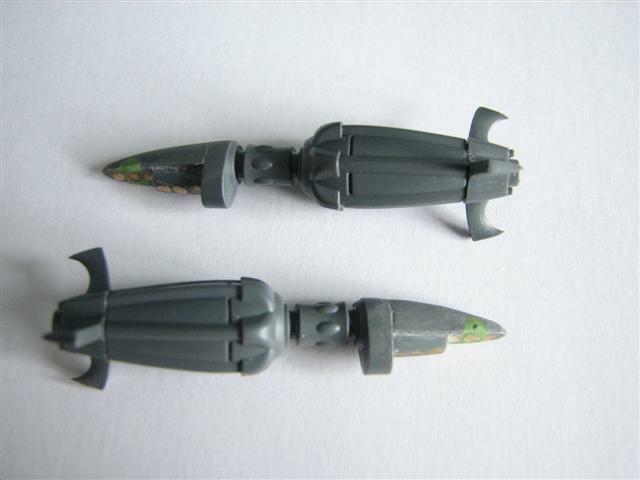 A side-by-side comparison of the two turrets. 14. 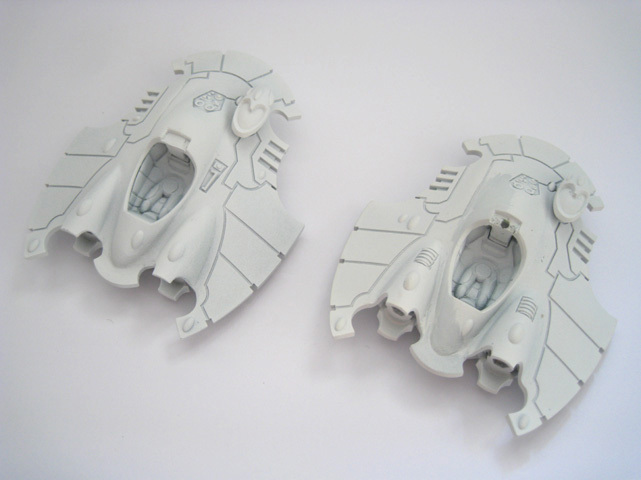 The two completed Fire Prism turrets; undercoated and ready for painting. 15. A Fire Prism, ready for painting. 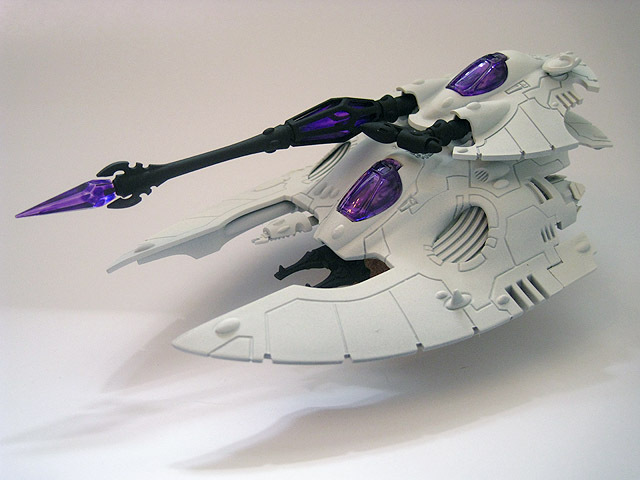 The transparent components have been tinted purple in the same fashion as the canopies.